The best thing about MMOs is that they are constantly updated, making way for fun, holiday themed events. The best thing about Halloween is the fact that I get to use the word spooktacular, and so I present NCsoft's multi-MMO Halloween Spooktacular of Values! Okay, no actual values, but events are running across all NCsoft massively-multiplayer titles, whether people play them or not. Guild Wars' event kicks off on October 24th with the return of Mad King Thorn, with mini-games, jokes, riddles, and prizes, in what many people have told me is the best MMO-Halloween celebration available. City of Heroes players will be fighting off zombies and collecting classic costumes for badges and trick or treating fun. Tabula Rasa has some quests. Poor Tabula Rasa. Hit the jump for more details, including what's in store for Lineage II, and Exteel players. Did someone say free giant mech paint jobs?Guild Wars On Friday, October 24, Mad King Thorn makes his return to Guild Wars in yet another ghoulish Halloween season in Tyria. Players can take on the king and his maniacal mini-games, jokes and riddles at their own risk. But the rewards will be worth the effort. Winners will earn fabulous prizes. Losers will be killed. But like any good Halloween event, you can always come back to try again. Other events for this Halloween season include a costume brawl in a newly designed area of Guild Wars, dreadful Halloween peddlers located in Lion’s Arch and Kamadan who will barter for their creepy items and photo ops where you can take your character’s picture amongst some of the holiday props and settings. More information on all the frightful happenings in Guild Wars can be found here, http://www.guildwars.com/events/ingame/halloween2008/. 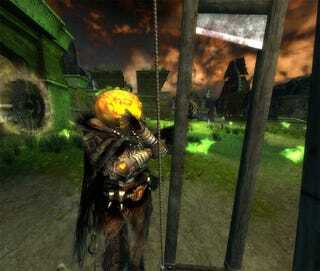 City of Heroes City of Heroes’ annual Halloween event is back again with even more evil twists. This season, gruesome zombies are on the prowl and they’re after all heroes and villains. In addition to fighting off the dead guys, City of Heroes’ Halloween event has a familiar look with Classical Costumes. Badges will be awarded to those who collect the most costumes. But don’t stop there. Wear your costumes and go out trick or treating in Paragon City. Check out http://www.cityofheroes.com/news/archives/2008/10/halloween_event.html for more info. Lineage II Lineage II players will be celebrating Halloween along with the launch of the latest update to the game, Gracia – Part 2. On Tuesday, October 28th, the day Gracia – Part 2 launches, all players level 20 and above who go to their warehouse will receive a Pumpkin Transformation Stick which will change the player into a pumpkin ghost. Additionally there will be a surprise gift, but we can’t tell you what this is until next week when the event starts. All the details about Lineage II’s special Halloween Haunt can be found here, http://www.lineage2.com/archive/2008/10/halloween_haunt.html. Tabula Rasa For the next two weeks players can participate in special Halloween missions scattered throughout Tabula Rasa’s expansive world. Complete them and you’ll get a trick or treat emote and one of nine masks. If you played trick or treat in Tabula Rasa last year, you may recognize some of the masks but some will be brand new. For more information visit http://www.rgtr.com/news/latest_news/trick_or_treat.html. Exteel Starting Wednesday, October 29, Exteel will be celebrating its first Halloween by giving all of its players the opportunity to paint their robotic Mechanaughts orange and black at no extra cost. They’ll also be able to enjoy their new Halloween-themed paint schemes while earning 50% more credits and experience for every match played in the game. Be sure to take advantage of it quickly—Exteeloween ends on November 5! For more information about Exteel go to http://www.exteel.com.